Sweet Potato Fries and Secret Sauce was posted on April 20th, 2011 and is filed under Dips & Sauces, Gluten Free, Kid Friendly, Recipes, Side Dishes. This entry has 9 comments. You can follow any responses through the RSS 2.0 Comment Feed. Who’s a fan of Boston Pizza? I rarely go there, but when I do I always know exactly what I want and it’s not pizza. It’s their sweet potato f and the delicious dip that goes with it. The first time I had it, I knew that I wanted to try to recreate their secret dip recipe. Its crazy delicious and I was certain I could make a healthier, lower-fat version. So I did. 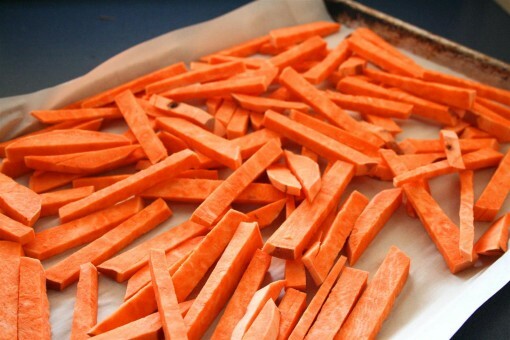 But first, the sweet potato fries recipe. Notice that the ingredients dimensions are pretty vague…just splash on whatever looks good to you, less oil for lower fat…less salt, more lime juice. You get the idea. The nutritional info is just based on an average. First, cut up the potato into fries. Then drizzle on the ingredients listed above. Bake at 400 degrees for 25-30 minutes. And because I was so excited to eat the fries I totally forgot to take a picture of the final product. My apologies. But they’re that good. This recipe serves 4-5. Simply mix up the above ingredients and devour. I love this on hamburgers, hot dogs, and as a dip for potato fries too. Today: I got home from my long trip yesterday night, so this day will be spent unpacking and getting my life all organized again. I also have a 4 miler on the schedule. Unfortunately, I didn’t get a whole lot of fitness in while I was gone, so I need to get back into the daily swing of things. While I was gone, since it was a holiday, I wasn’t as careful about my eating, so I’m going to tighten things up a bit. Here’s some of my mini goals for today. Do you have a restaurant recipe makeover you’d like to share? Do you have any tips for getting back into routine? Sweet potato fries are my favorite!! My roommate just made some a couple days ago. Dipping sauces are always fun too! 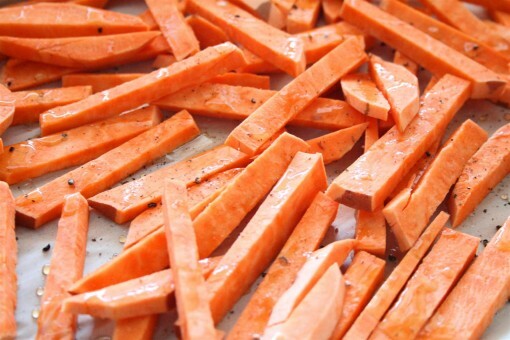 I adore sweet potato fries, and combined with your sauce it should be a hit. These look great, especially with that dip. You’ve got such a great site! I can’t wait to see more. Thanks guys! Appreciate your comments and encouragement! Your dip isn’t right at alll!!! I used to work there all the dip is, is Cajun spice and some mayo !!! Falen~ It wasn’t my intention to make it exactly like Boston Pizza’s…I just loved it so much, I tried to created a healthy version that tasted similar!